The most obvious thing I guess, my family. Although saying that I am truly blessed with the family I have. I am really looking forward to being at home over Xmas have long chats with my mam, devouring my dads cooking, and fighting with my sister haha. My dogs. 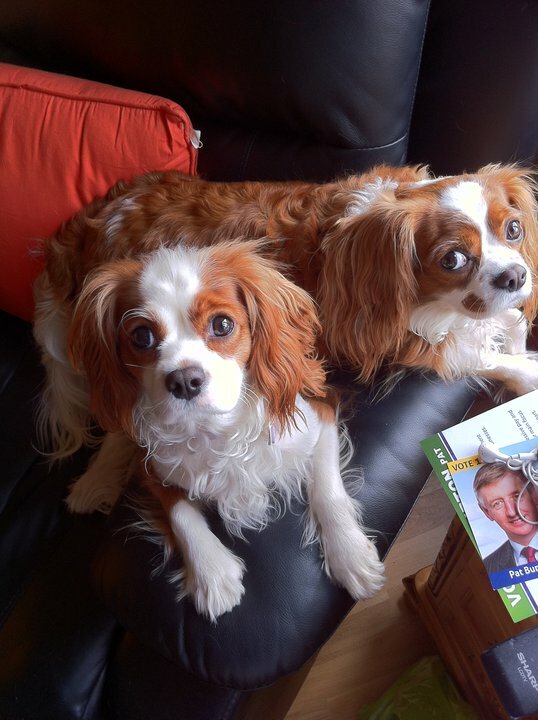 I have two Cavalier King Charles dogs, Bella and Mona. Bella is the mammy dog and Mona is her baby. I love them so much and really miss them. When I am having a bad day I just love how they kiss me and curl up with me and their unconditional love makes me feel so much better. My actual dogs!! The only picture in this post because they deserve centre stage. My friends. I definitely have some of the best friends in the world. We are all scattered in different parts of the world but you know your true friends when that doesn’t make a difference. I love them to bits and can’t wait to have some adventures at Christmas. Glee! I absolutely love this show. Nothing like an episode of Glee to lift my spirits. I really wish something like this was around when I was in school. It definitely would have made it a hell of a lot easier! Food. Eating is by far my favourite pastime. I was a really picky eater before but I am getting more adventurous now, especially with all the different delicacies Germany has to offer. I sure do miss a bag of chipper chips and a cheese and onion pie. Forget alcohol, being food drunk is the best! Reading. Reading a book for me is better than watching a film. It enthralls me much more and I love sitting on my couch on a rainy day getting lost in a far away land. Looking at old pictures. I try to take a many pictures as I can, especially of the people present in my life at that moment. Someday they may be the only link to my past. They evoke a lot of different emotions in me; sometimes sad reminding me of times gone by, and sometimes they make me laugh out loud thinking of the ridiculous and hilarious things which have happened in my life so far. Clothes. I love clothes and would gladly spend every penny I have on them. I don’t really have a style per se and I just wear whatever I feel like at the time. I heart the styles of Victoria Beckham and Fearne Cotton but my heart truly lies with the ladies of the 1920’s. Bring back the flapper look! Shoes. I have over 160 pairs. That speaks for itself. So that is all from me for now. These are only a few of the things I enjoy in life and I hope to indulge more about my little life to you in further posts.